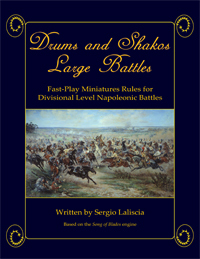 Drums & Shakos Large Battles is a system of rules for Divisional level battles of the Napoleonic Period (1805- 1815) where each player controls 2-3 Brigades and a small reserve. In multiplayer games each player may control a Division, effectively playing at Corps level. Jeremy Ward 10 9 9 Some brilliant ideas in this, lots of food for thought.